A few weekends ago I was left home alone. My lovely wife was in Vegas for a conference. I decided to take advantage of the opportunity and head up North to an area I’ve always wanted to check out, the Latir Peak Wilderness. 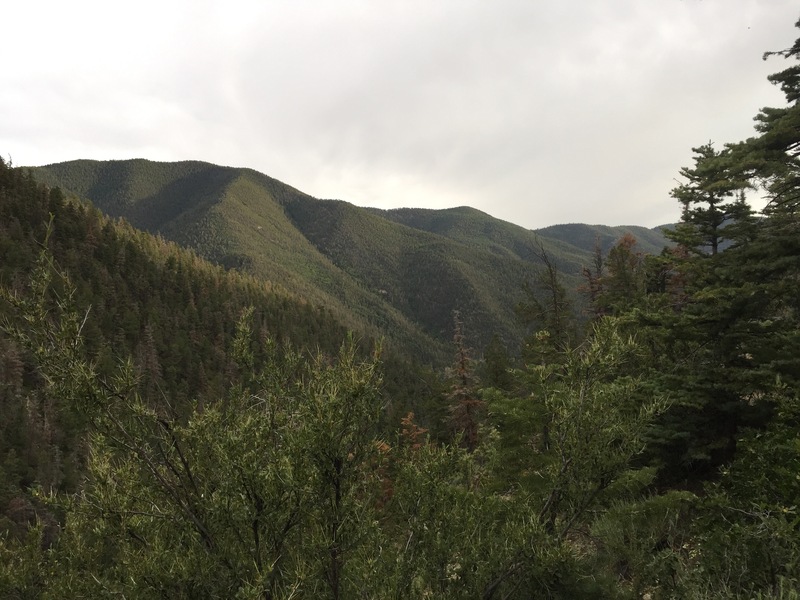 The wilderness area is located just North of Questa in one of the less-visited areas of the state. I was attracted to the area by a little known lake, Heart Lake. 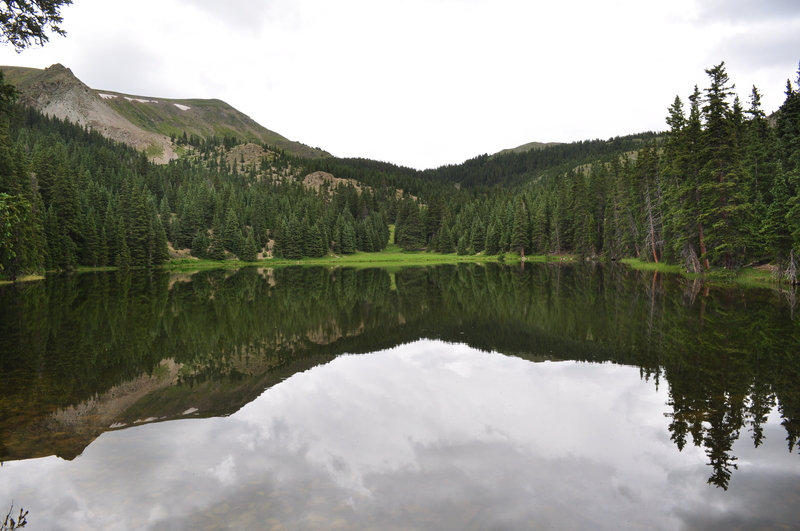 It is a lake I had a hard time finding information about and is barley mentioned in my “go to” New Mexico Fly Fishing guide book. 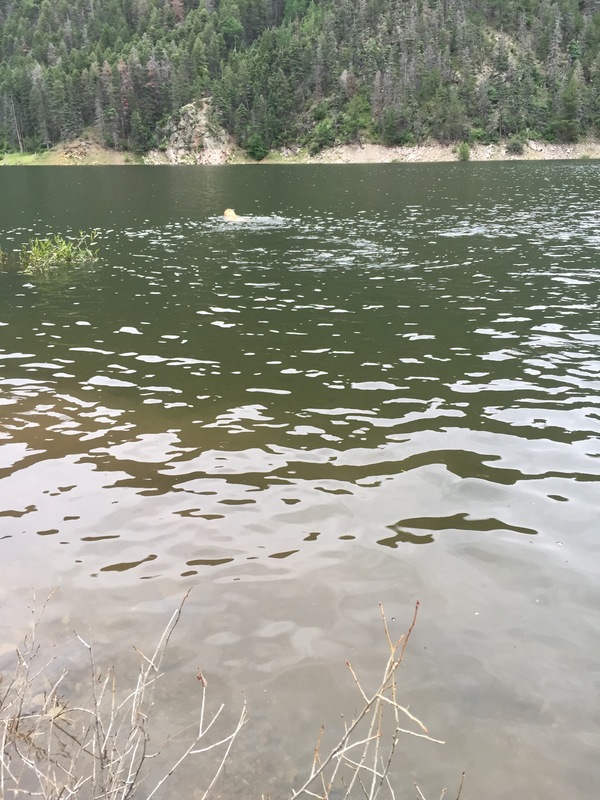 This could mean one of two things, there are zero fish in the lake or there are monster Rio Grande cutthroat trout lurking in it’s depths. My guess was the aforementioned, but I thought it wouldn’t kill me to go and check it out. I packed up the dogs and headed out on a Friday afternoon. Since Cabresto Lake is where the trail starts, it was naturally a good spot to make base camp. 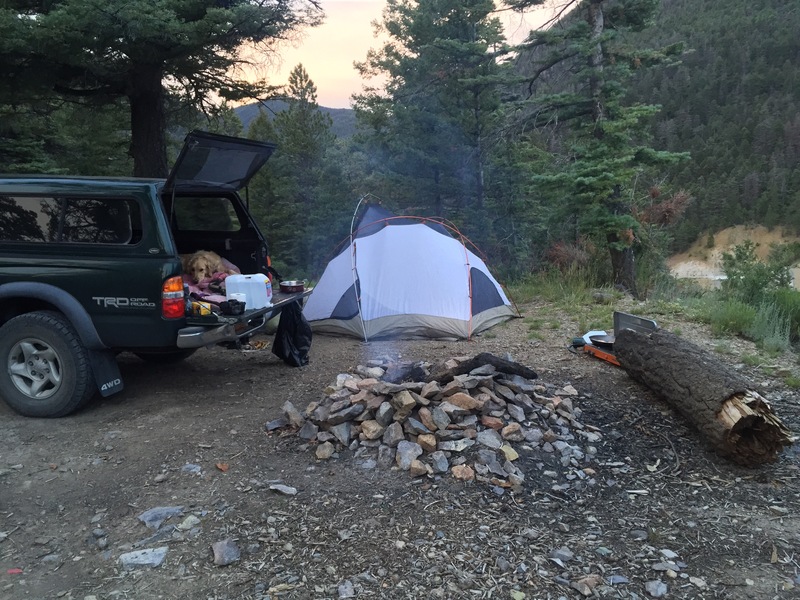 The forest service website promotes 9 established campsites. I counted 5 with one being the parking area, keep that in mind if you are heading up there for the first time. I got lucky and was able to snag a spot that overlooked the dam. Being able to hear the water run through the canyon below the lake as I made dinner set the mood for a nice evening. The 2 mile road up to the lake is rough. I did see a car in the parking lot, but wouldn’t recommend driving one up there. After setting up camp I decided to take the dogs on a small walk to tire them out a bit. 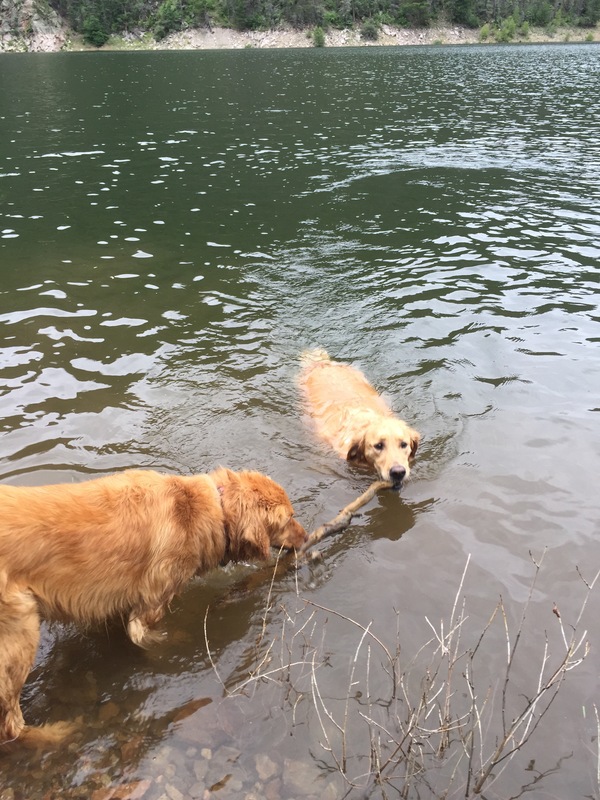 We have two dogs, Molly, a 5 year old Golden Retriever, and Penny, a ~3.5 year old golden mix. As soon as we crested the small hill and saw the lake Molly stared to get really excited. As soon as I let her off the leash she was halfway across the lake. 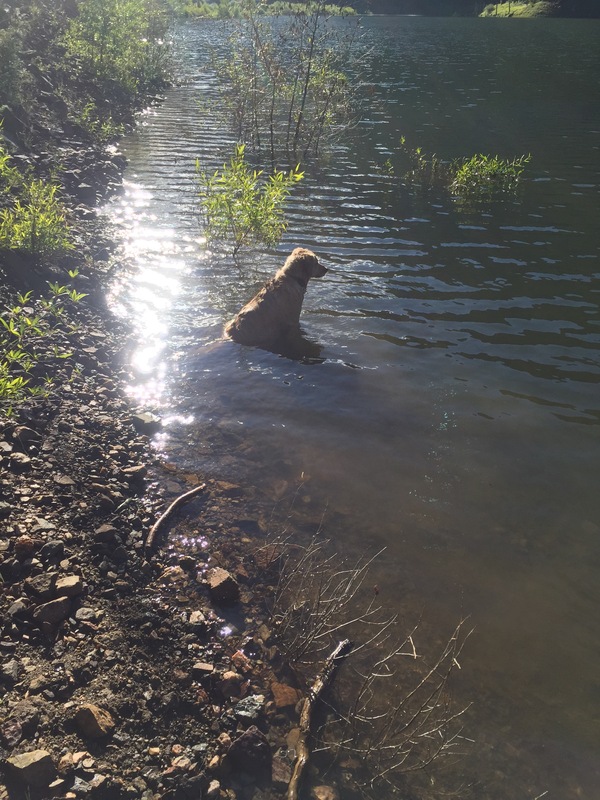 I remember when she was a puppy and would barley step foot into the water. After some water aerobics I dragged the dogs back to camp and made some food to energize for the morning hike. Heart Lake is located about 4 miles from Cabresto lake via Heart Lake Trail. The trail mainly runs through dense forest with a small meadow here and there. 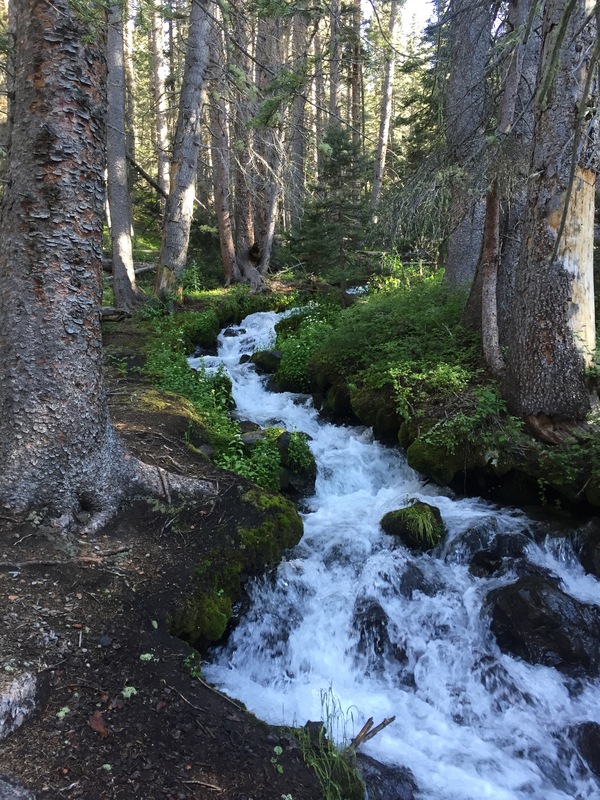 A creek runs alongside the trail giving the ambiance of untouched nature. 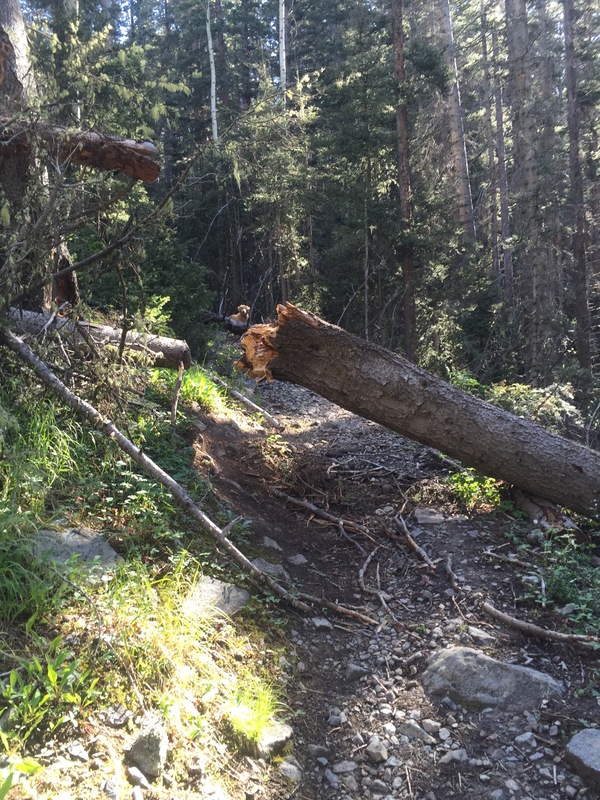 The trail maintains a pretty steady gradient that increases as you get closer to the lake. 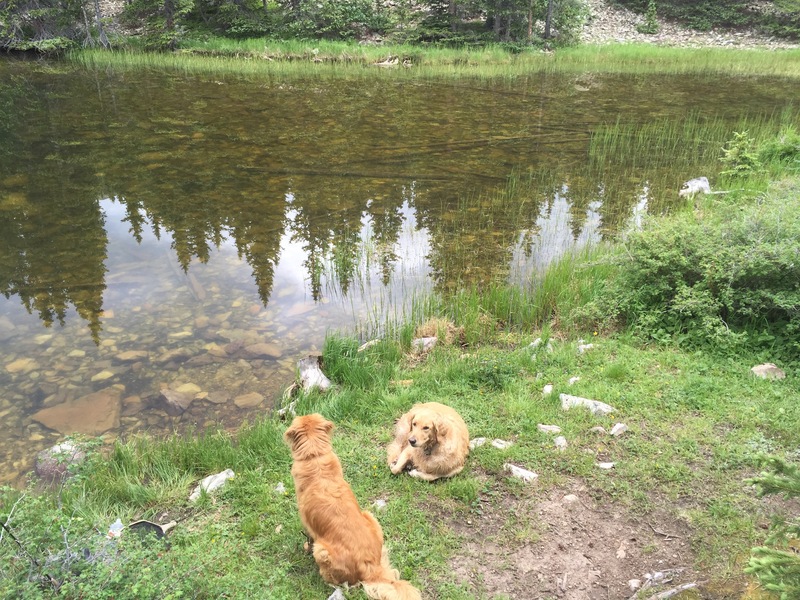 In my 4.7 mile hike I gained about 2,300 ft in elevation ending at 11,500 ft. Once I passed Cabresto I let the dogs off their leashes so they could run around to their own desire. 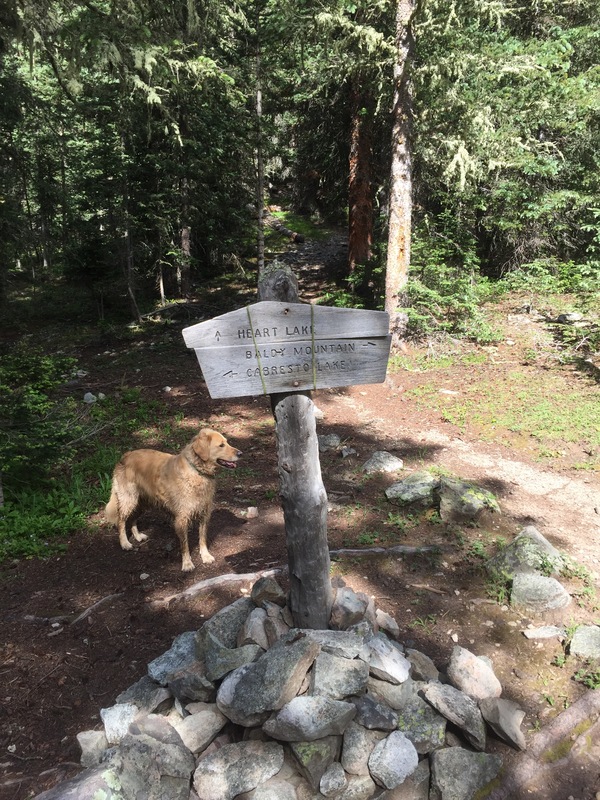 I was getting a good laugh out of Molly as she would run up the trail and then wait to make sure I was still coming. After some of the snags on the trail I could see her sitting in the distance looking back to make sure I was navigating my way through the maze of fallen trees. The creek next to the trail looked like a haven for native Rio Grande cutthroat. 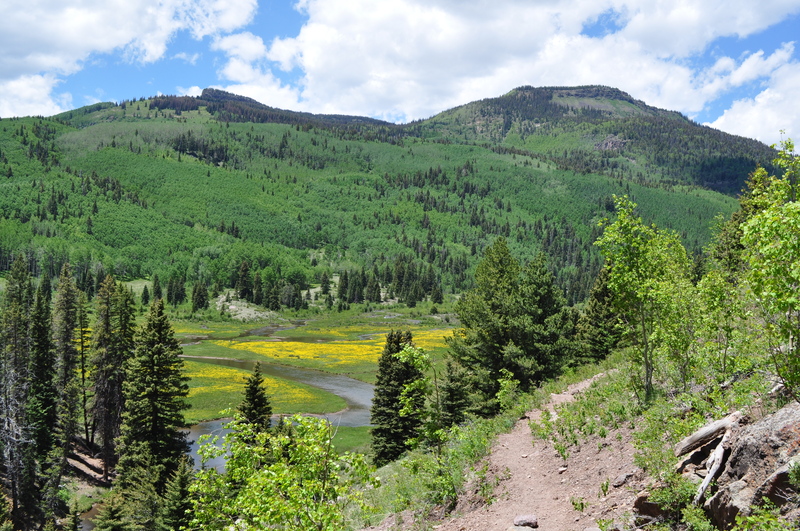 We finally hit the second fork in the trail and headed up the final mile to the lake. Whenever I trek to these alpine lakes for the first time I feel this strange suspense. The unknown can be very intriguing. There is something very special about the first sight of the lake. Maybe its the realization that the hiking is downhill the rest of the day. I found a nice place to sit, eat lunch, assemble the fly rod and try to spot fish. 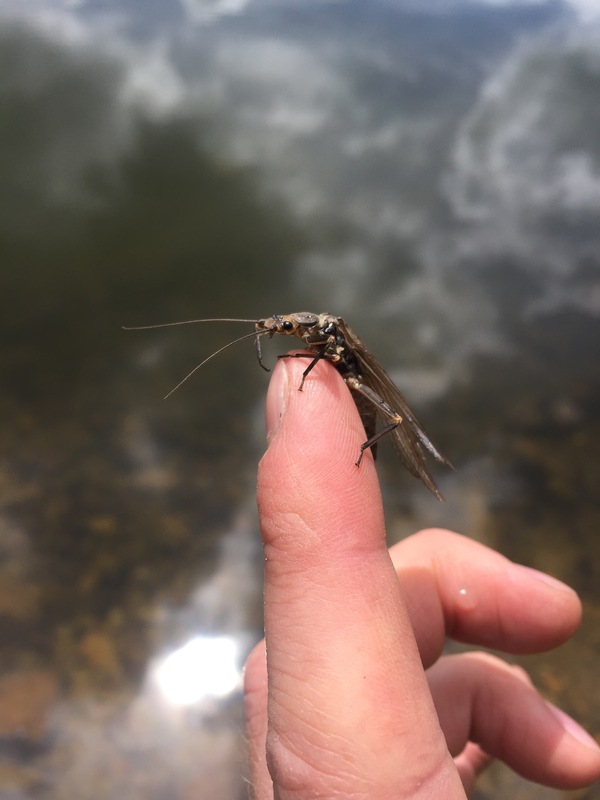 There were hundreds of large caddis coming off of the lake filling the lakeside timber. I couldn’t help but imagine all of the fish I was going to catch. There was just one problem, I didn’t see any fish cruising or surfacing. I setup the rod and started making cast after cast. I tried leech patterns, scuds, caddis, attractors, I couldn’t find anything to move a fish. After about two hours of fully engaged fishing with nothing to show for it, I looked at the sky and saw dark grey clouds accumulating right above me. Sometimes when I’m fishing I get so focused I start to lose awareness of my surroundings. I decided it was time to lick my wounds and start heading back down to camp. On the way back to camp I stopped on a section of the trail that had some nice access to the creek. As I sat there looking at the small stream replaying all internal video of the lake I noticed a sharp movement about 20 ft down stream. I stared attentively in that section of the creek. I saw a quick jerk of red come out from the slightly undercut bank. I couldn’t resist and quickly had my TXL 3 weight in hand with a small elk hair caddis. The first cast I made was perfect, the fly hit about a foot above the small trout. As the fly traveled past, the trout turned and started chasing it down the creek. It quickly struck, I set the hook and saw the fly pass by me through the air, I missed! I couldn’t believe it. I sat there for a moment swallowing my pride and then noticed the fish had begun to start feeding again, no one said these were the smartest fish. The next cast landed about two feet above the trout and it rose smoothly and chomped down on the fly. This time I got him! 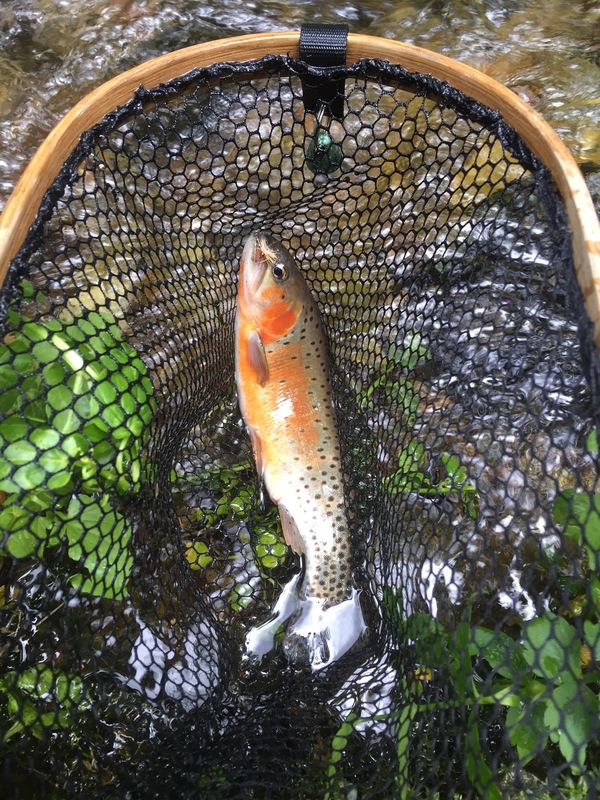 As I brought the fish in I could tell it was going to be a beautiful pure cutthroat. For those of you who don’t know, its not easy to find pure Rio Grande cutthroats, or any cutthroat for that matter. Thanks to the generations of stocking rainbow trout in these waters native bloodlines have digressed. This is said for many native species across the board. Not much we can do about it now, but it makes them that more elusive and special to find. I made it back down to Cabresto Lake and fished the inlet for a bit. It seemed as though the water level was a lot higher than it had been in years past. A lot of the greenery was feet below the water surface. The dogs were in the water cooling off right away, but I managed to catch a few small brookies before calling it a night. 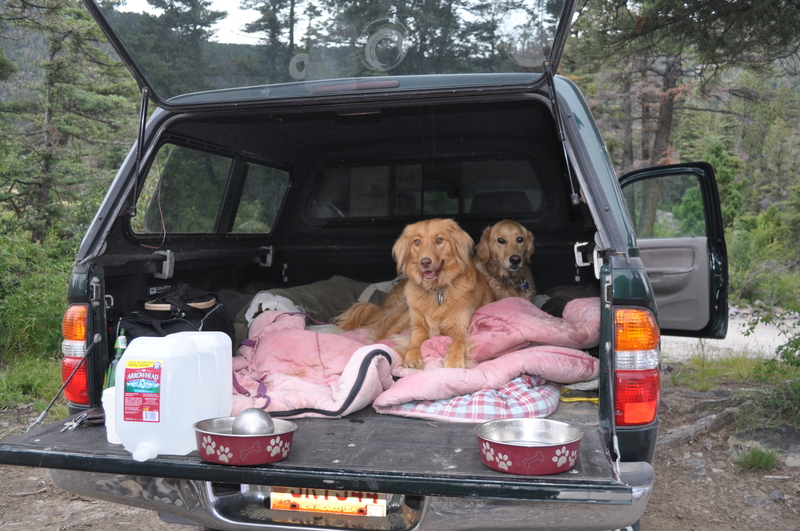 The dogs were pretty content by the time we made it back to the truck. I started a nice fire, kicked up my feet, and enjoyed an ice cold adult beverage. Its hard to compete with the cool midsummer air of the Sangre de Cristo Mountains. This was my first time to Cabresto Lake and the surrounding area. Cabresto is a very pretty lake in a nice mountain setting with lots of fish in it. I fished the lake the next morning for about an hour and caught a handful of fish, all brook trout. I would recommend it to the weekend warrior heading out from Albuquerque or another New Mexican city. There is a lot more wilderness to explore than what I did. I am sure if your main goal is hiking than this is a prime location. The fishing is really limited to Cabresto and to the most dedicated fisherman on the small creek flowing into the lake. Most of the creek has dense cover protecting the small fish within it. The lake itself saw a lot of visitors on Saturday but was pretty quiet at night and there was enough space to yourself during the day. Molly just checking to make sure I make it past the snag ok. There were a handful of spots like this on the trail. 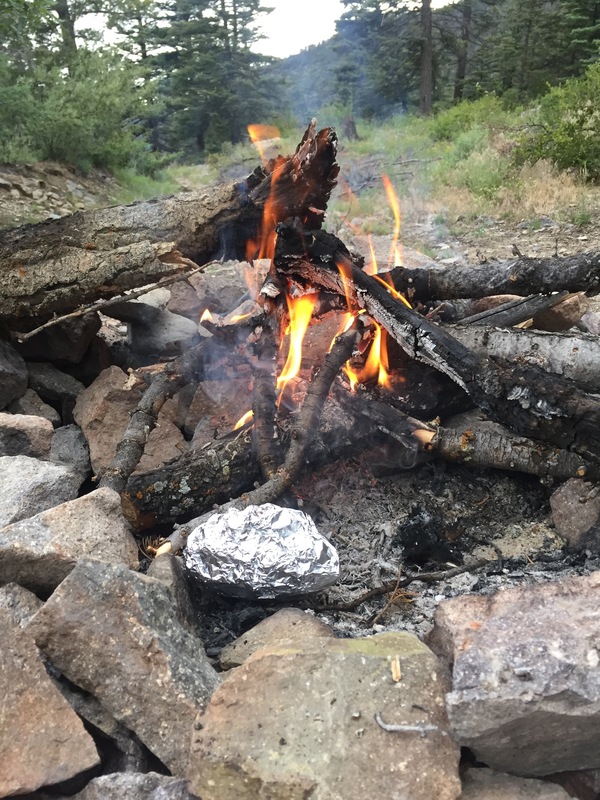 How a real outdoorsman cooks a potato… or burns a potato! Now that’s some serious MANTIME! Takes man to know man!